This yogurt is not tart, and has a delicious sweet/creamy taste. 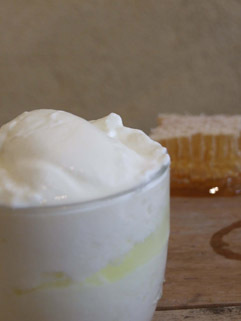 The Honey and Vanilla flavour is subtle to ensure the true texture and flavour of the yogurt is experienced. Over the last 10 years, the health benefits from yogurt have become more widely recognized. Yogurt is generally made from cow's milk, but yogurt made from sheep's milk can be more beneficial to your health. Sheep milk is the original yogurt that was made in the mountains centuries ago. There is no added sugar. Sheep produce thicker milk so there is no need for stabilizers. Compared to cow's milk, yogurt made from sheep milk has double the amount of calcium and protein, and 50 more iron. It is also higher in vitamins A, D, C, E and B and has less salt.